Find below a selection of some informative websites on classic cameras and photography equipment. A very nice site with a lot of information about the coloured, i.e. non-black, cameras Kodaks produced over the years. Great to see a full series of Beau Brownies next to each other. 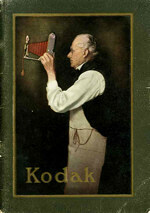 Kodak has used pictures and drawing of women and girls for many, many years. Martha Cooper has collected old paperwork and puts this showcase on the web. Nice clean layout, and a great source of information on advertising. 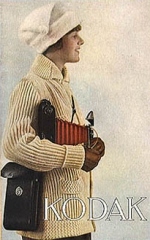 This site by Mario Groleau contains many old Kodak catalogues. Not, as often, only the front cover but the entire catalogue has been scanned and can be read. Very informative. Although the site is written in French, it browses smoothly and the majority of catalogues are in English. This collection contains a wonderful mix of photographic related items representing the evolution of equipment and marketing of the Eastman Kodak Company over 120 years. Chuck's website is dedicated to Brownie photographers everywhere: past, present and future. 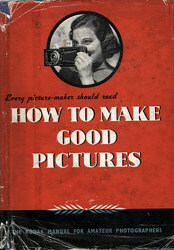 A website dedicated to the Kodak book series 'How to Make Good Pictures'. A wealth of information on UK and world editions with many great scans. Nothing shows a era better than it's books and it's pictures. Kodak celebrated 100 years Brownie Camera in the year 2000 and did a project where they asked people about personal Brownie stories. 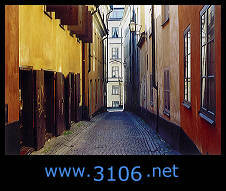 The results can be seen on this site and of course it also includes the history of Brownie cameras. The official Kodak site. Historical information can be found under Corporate > About Kodak > Milestones. Stephen Gandy's CameraQuest has information on many, many collectable cameras. 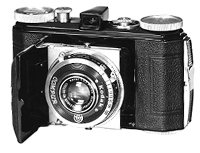 The links below links to the famous/infamous Kodak Ektra camera. Extensive information on the Kodak Retina line of cameras. Walker's Kodak Collector's Page is there to display and describe his collection of Kodak cameras. A lot of information can be found and I always discover something new with every visit. This is my other, personal, website, containing information about me, my camera and film colection and photography.